NCLC’s survey of 42 states’ unemployment compensation prepaid cards reveals that fees are down, but some states still refuse to offer or inhibit the choice of direct deposit. Giving recipients the choice of direct deposit to their own account before enrolling them in the prepaid card allows recipients to choose the fastest, most convenient, least costly method to receive benefits. Importantly, it is also the law. Most workers choose direct deposit to their own account when the choice is made easily available. Minnesota has the highest direct deposit rate of 82%, and Arizona’s is the lowest at 16%, with a median rate of 57%. 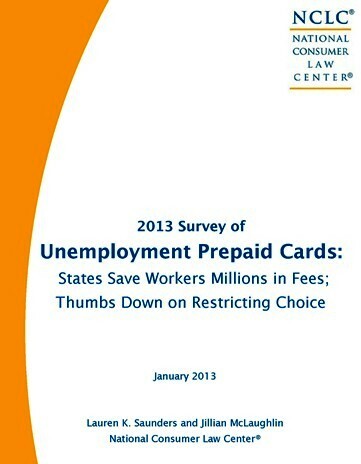 Five states (California, Indiana, Kansas, Maryland and Nevada) violate federal law and require workers to receive benefits on the state vendor’s prepaid card. Many states have lowered fees on their UC prepaid cards. Overdraft fees have been eliminated, point-of-service fees are nearly gone and ATM fees are easier to avoid. In Pennsylvania, the state projects that workers will save $5.2 million through several improvements to the card program. NCLC now rates 18 cards as “thumbs up” and only 3 as “thumbs down” (out of 42 cards). In 2011, 8 cards out of 40 merited a positive rating and 16 were negative. Prominently offer direct deposit to the worker’s own account first, at time of application, and make sign-up easy. Offer a minimum of one free ATM and teller withdrawal for each deposit and preferably more. Eliminate fees for balance inquiries, customer service and denied transactions. Monitor fees and involve workers and advocates to address excessive costs. Publicize methods of fee-free cash access and card use. Offer prominent, complete and accurate fee information on the state website.